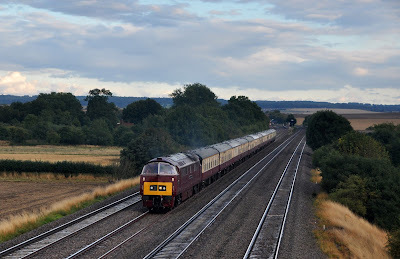 After more than three years away from main line duties, D1015 'Western Champion' made a welcome return to the main line on September 7th 2013 hauling Pathfinder tours 'The Western Wessexman' trip from Leicester (D1015 attaching at Bescot) to Weymouth. The train is pictured here at Cholsey on the GWR between Reading and Didcot. Hopefully there will be some more opportunities to photograph this classic locomotive at spots like this before the electrification renders such scenes impossible.